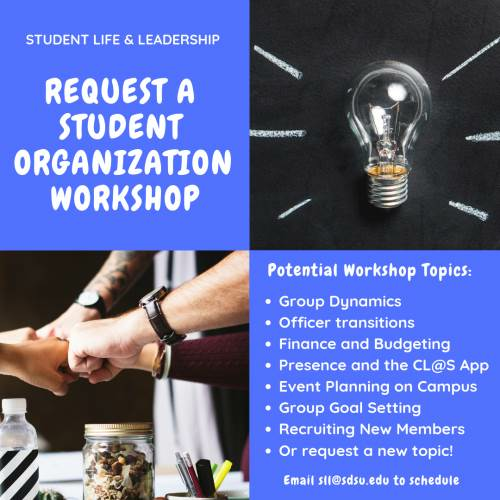 The Student Life & Leadership Office offers a variety of developmental and leadership workshops for recognized student organizations and campus groups. Request a workshop for your organization by emailing sll@sdsu.edu. Or request a new topic! Student organizations are expected to reserve a space for any presentations requested. Space requests outside of general business meetings need to be approved through the Event Approval System. Workshop requests made outside of regular business hours will be subject to staff availability. Gain valuable information from the convenience of your computer or smart phone with our video workshops. Visit the links below to complete the Work Space Application and/or Basement Storage Space Application. The deadline to submit the application with all supplemental materials is Monday, January 28, 2019 at 9:00am. Your organization must be RECOGNIZED in order to be awarded a work space and/or basement storage space. Success Inspirational Quote (copy) on Biteable. This year, in collaboration with many campus partners, Student Life & Leadership is offering three different involvement expos for student organizations. The Involvement Expo that best fits your organization will be based on the organization type, as listed on the Recognized Student Organization (RSO) Application. 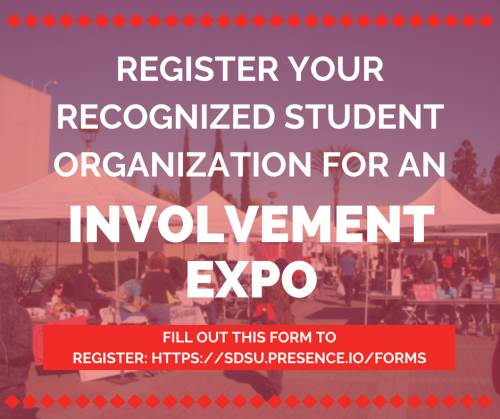 To learn more and to register for an expo, please visit sdsu.presence.io/forms. Applications are due by Monday, August 20, 2018 at 4:30pm. Student Organizations must have a SUBMITTED Recognized Student Organization (RSO) Application in order to be eligible to participate. Registration does not guarantee your organization a spot as space is limited. After completing the Student Organization Involvement Expo Registration Form, each organization will be contacted by Student Life & Leadership to confirm attendance.